Season chicken thighs with salt and pepper. Set a large ovenproof skillet to medium heat and add 1 tsp. of olive oil. Once hot, add chicken, skin-side down. Cook until skin is browned and chicken is cooked halfway through, about 10 minutes. Remove from heat. 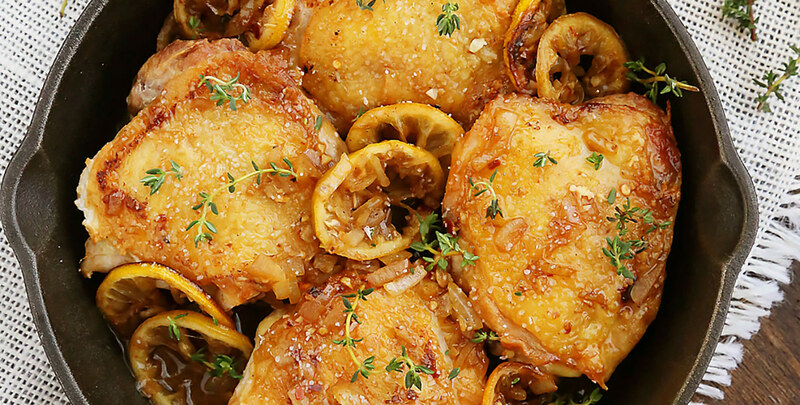 Arrange lemon slices underneath and around chicken, keeping skin-side down. Place skillet in oven and roast until chicken is fully cooked and skin is crisp, about 10 more minutes. Transfer chicken pieces, skin-side up, to a plate. Leave lemon slices in skillet. Return skillet to medium heat. Add thyme, onion, garlic, and red pepper flakes. Cook, stirring frequently, about 2 minutes. Add Holland House® White Cooking Wine and broth. Simmer until reduced by half, about 5 minutes. Season with salt and pepper. Drizzle with 2 tsp. oil. Return chicken to skillet, skin-side up, to rewarm. Top with caramelized lemon slices. Serve with crusty bread for dipping, if desired. Enjoy!